This letter was written by Pvt. 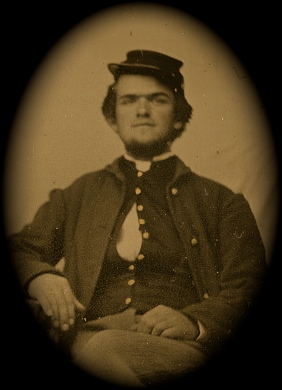 Edward William Curtis (1837-1886), of Company I, 88th Illinois Infantry (also known as the Second Board of Trade Regiment). Edward was the orphaned son of William Curtis (1810-1857) and Lucy Hubbard (1814-1838) of Hatfield, Massachusetts. Though Curtis was never injured, long marches left him weak, with the result that he was often transfered to a convalescent camp and left to catch up with his company later. He was mustered in August 27, 1862 and spent most of his time with his company in Tennessee around Nashville, Murfreesboro, and Salem; and in Alabama at Bridgeport. Curtis was mustered out on June 16, 1865. 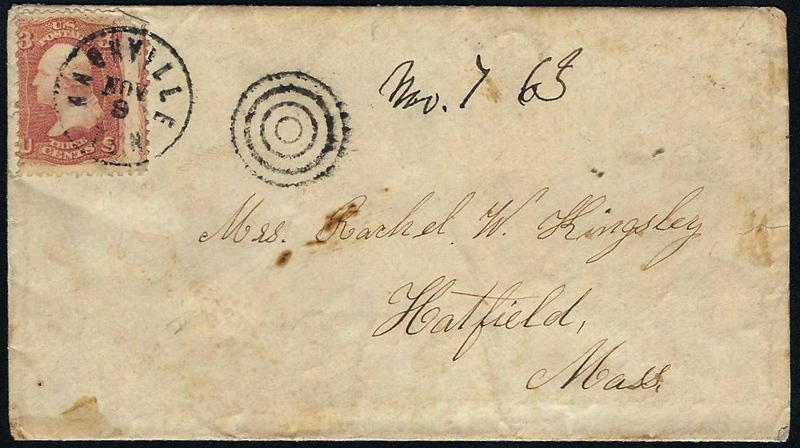 This letter is not dated though the envelope dates to November 1863. I believe the letter was actually written early in 1864, however.¹ Unfortunately we can’t date the letter based on the movements of the 88th Illinois because it is clear that Pvt. Curtis was left behind by his regiment as they moved eastward. Edward wrote this letter to his Aunt Rachel W. (Curtis) Kingley (1817-1900), the wife of Moses W. Kingsley (1815-1894) of Hatfield, Massachusetts. Rachel’s son Seth W. Kingsley (b. 1844) served in Company K, 52d Massachusetts, and was another favorite correspondent of Edward’s. Several of Edward’s letters may be found in Newberry Library in Chicago. I have this day received the papers you mailed the 25th but have, as yet, found but little time to look at them, but I am still at my old post and well. The “division” that has been stationed here the past winter guarding this place — about 8,000 strong — started this morning for “the front” and all their sick were brought in here, which with about 50 from the convalescent camp which has been broken up, filled the hospital to overflowing, and a lot were sent to Nashville this morning. Notwithstanding, my tent is still full (10 patients). Besides the moving of troops here, the 15th Army Corps — about 25,000 strong — is passing through to the front as I write from back towards Memphis. Besides this, the pontooneers here have started for the same place and possible ‘ere this reaches you, will be heard the clash of arms and the thunder of cannon in this section of the country. May we have better success in the coming contest than seems to have fallen to our arms in Banks’ department. I enclose a few cotton seeds for you to plant in a pot if you would like. I got them out of some cotton which was put in a bed last fall. They may not grow. It is possible that if there is a fight at the front, I may be so employed as not to have time to write as regularly as of late. Nevertheless, I hope that you will not stop for me to write. I just had a letter from Uncle Edward [Curtis] All were well although he says Alonzo [Curtis] has had a hard time getting rid of the itch and “grey backs” since he got home. James [Curtis] is at Dalton, Georgia. ² Thomas Cutter and wife had been there this winter and Mr. Cutter seemed to think that he was “some” in a trade and could not be taken in by Cincinnati Jews, and as an evidence of it came back one day from Cincinnati with a Pinchbeck watch for which he had traded a gold one (?). He wanted to borrow money to enter into tobacco buying on a large scale and at last borrowed the money to get home with! So much for yankee sharpness (?). ¹ References to troops leaving Bridgeport, Alabama, after being “stationed here the past winter,” combined with news of Gen. Bank’s failures on the Red River Campaign, and the 4th Ohio Cavalry being in Dalton, Georgia, all suggest that this letter was written sometime in the spring of 1864, not in 1863. ² Edward’s cousin, Alonzo Curtis (1845-1907) served in Company E, 4th Ohio Cavalry. Alonzo’s brother, James B. Curtis (1842-1910) served in Company D, 4th Ohio Cavalry. They were the sons of Edward Curtis (1815-1886) and Eleanor Bullard (1823-1879) of Mill Creek, Hamilton County, Ohio. Griff, what a beautiful website, and a wonderful service you are providing. I came across your letter while searching on Edward W. Curtis, since we are putting together a Civil War exhibit at the Hatfield Historical Museum to open April 5. I knew about the Newberry Library stash of Edward Curtis letters, and I have just now discovered that they have a transcription project under way, so at least some of the letters (I’ve just started looking) are transcribed, accompanied by the letter images, just as your website. Very exciting! We will include a link on our website to this page, and perhaps a QR code at the exhbit. If you still hold this letter in your possession and would ever consider donating it to the town of Hatfield for our Historical Museum, we would love to preserve this in the place of Edward’s birth. In our exhibit, we have Edward’s backpack from the 88th Regiment, Co. I, his discharge papers, and his GAR Veterans Badge. Thanks so much for doing what you’re doing! Griff, so long as you credit the Hatfield Historical Museum and can give the link to our website, we’d be happy to send along images of those items (as soon as we shoot them). Could we also use images of your letter (and the envelope, in particular), as well as an excerpt from the letter in our exhibit, credited to your website? Also, just to clarify — the soldier pictured is not Edward W. Curtis, right, just an unnamed Civil War soldier? We’d love to get a photo of him and will let you know if we do!